This is a fine example of the Society for the Diffusion of Useful Knowledge or S.D.U.K. map of Australia. 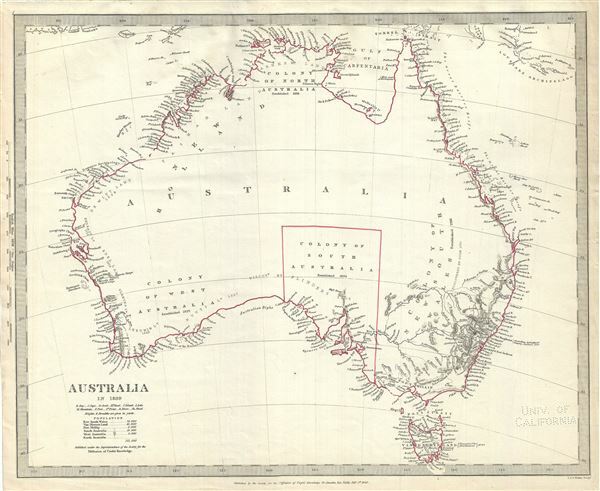 It covers the entire continent of Australia along with Van Diemen's Land or Tasmania in 1839. An interesting map issued just as most of the earth's non-polar shore has been explored. Gone are many of the errors of the previous century with the coastlines accurately rendered. Inland though, much remained confused. Vast stretches of unmapped territory and speculative cartography fill central Australia. The Colony of South Australia, established in 1834 is the only colony marked with an outline boundary. The map also notes several other colonies including West Australia, established in 1829, New South Wales, established in 1788, and North Australia, established in 1838. It identifies the years and names of the explorers who discovered these lands, including Cook in 1770, Flinders in 1802, Nuyt in 1627, de Witt in 1628 and Abel Tasman in 1642, among others. This map was originally copyrighted in 1840, but was issued in Volume two of Chapman and Hall's 1844 edition of Maps of the Society for the Diffusion of Useful Knowledge. It was engraved by John Walker of J. and C. Walker. Rumsey 0890.155. Phillips (Atlases) 794.